Shortly before I turned 5, my family moved from Denver to a little town in southern Illinois. We took a long two cats, Gracie and Marshmallow, some gerbils, and some fish. Not long after we settled in, the neighbor’s cat came around to visit with her kittens. She did this everyday for a couple of days. It was late fall, and the weather was turning cool. Mom couldn’t stand it, and she started leaving out food. Pretty soon, the mamma cat stopped coming, and only one little kitten remained. Somehow mom and I convinced my dad that we needed to take the kitten in. So, into our lives came a third cat, which in my 5 year old wisdom I named, Andrew George Mittens the Third. Andrew came about because at the time I was convinced that “Andrew” was simply the greatest boy name in the world. George was attached because our cat Gracie was named after Gracie Allen, so I thought it was appropriate to name the boy cat after George Burns. Mittens was because he had little white paws that emerged from his tabby coat. I didn’t quite comprehend the fact that “the Third” referred to line of descendants. I just thought it fit since he was the third cat we had at the time. Anyway, Andrew, George, and the Third rarely got mentioned, and he came to be known as Mittens. Mittens quickly grew from being a tiny pathetic kitten, into a bit of a behemoth. He remained this for as long as he was in my life. The first year I was in 4-H, I decided to spend the year preparing my cat to be judged at the county fair. Owning him was as close to owning livestock as I was gonna get. When I took him to the fair, I had to take him up to a panel of judges which included a veterinarian. Things didn’t exactly go smoothly. Mittens decided it was a good time to hiss and be generally unsociable. My mom ended up coming and holding him in place. The vet was terrified of him. I think the fact that I wasn’t scared of something she was, is what got me a blue ribbon. We discovered, one day by chance, that Mittens could be called by the sound of hysterical crying. We were watching an episode of Little House on the Prairie, and Mittens was nowhere around. In the episode, Nellie Olson started fake hysterical crying. Out of nowhere, Mittens lumbered in desperate to check on mom and I. He was certain something was wrong. He never failed to come when I was crying. When I turned 9, I had a really bad case of pneumonia. It actually hit a few weeks before my 9th birthday, and lasted until the middle of February. I missed the better part of 3.5 months of 3rd grade. The night I was at my worst, was the day we had gone to the doctor. The doctor prescribed me meds, and told my mom that if I got worse, I had to be admitted to the hospital. That night, mom sat on my bed and pleaded with God. To say we were poor would be an understatement, and there was no way we could’ve afforded a hospital trip. All that night mom prayed, and like he had from when I started getting sick, Mittens sat attentively on the foot of my bed. I did start to slowly get better after that night, and didn’t have to go to the hospital. Two weeks later when we went to the doctor for a check-up, he was in shock. He told my mom that he had thoroughly anticipated that I would be in the hospital the night of my last visit. He also told her that he had expected that I would die in the hospital. 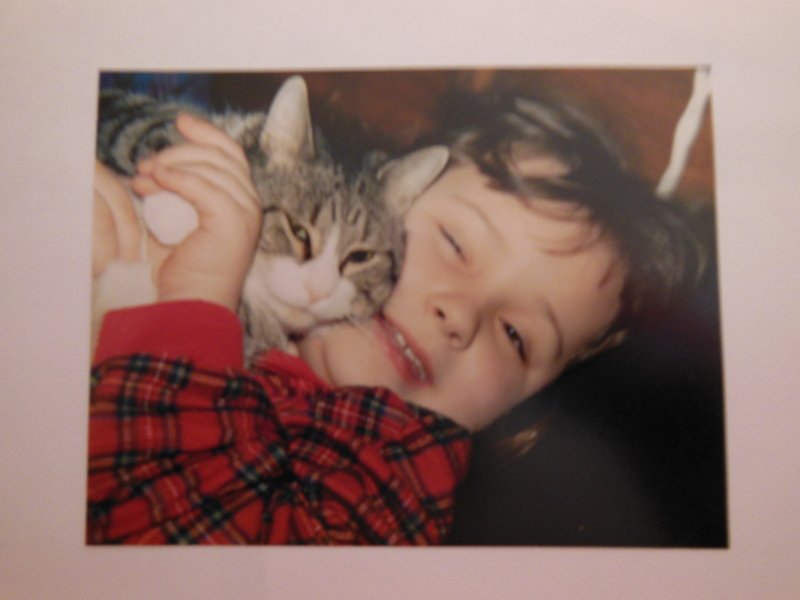 Mittens lived with us, and saw me almost all the way through my teenage years. He was fat, and precious, and crabby, and wonderful. When I was a freshman in college, I was living several hundred miles away from home, and things at home took a bad turn. My parents moved, and they couldn’t take Mittens with them. So, he went to live with a neighbor. He was really old at that point, and not in the greatest health. I never got to say good-bye, but I think (or at least I hope) that he somehow knew that we loved him and didn’t leave him willingly. I’m sure he’s gone on to kitty heaven by now, but I hope he knows how marvelous and how precious and how important he was in my life.